Stroganov Palace in St. Petersburg was created by the greatest architect of the XVIII century Francesco Rastrelli. The building is located in the heart of the Northern capital - at the crossing of the Moika Embankment with Nevsky Avenue. The Stroganov Palace is a model of Russian baroque, which reached its heyday during the reign of Elizabeth Petrovna. In subsequent years, other outstanding architects participated in the reconstruction and creation of new interiors of the building. Until 1740 the area along Nevsky Prospekt, 17 belonged to the tailor Johann Neumann, for whom, according to the project of architect Mikhail Zemtsov, the house has been built here. In 1742, this land was bought by Baron Sergei Stroganov and completes a two-story house. In 1753, Stroganov invited for the construction of a new three-story stone building of the court architect Francesco Rastrelli. 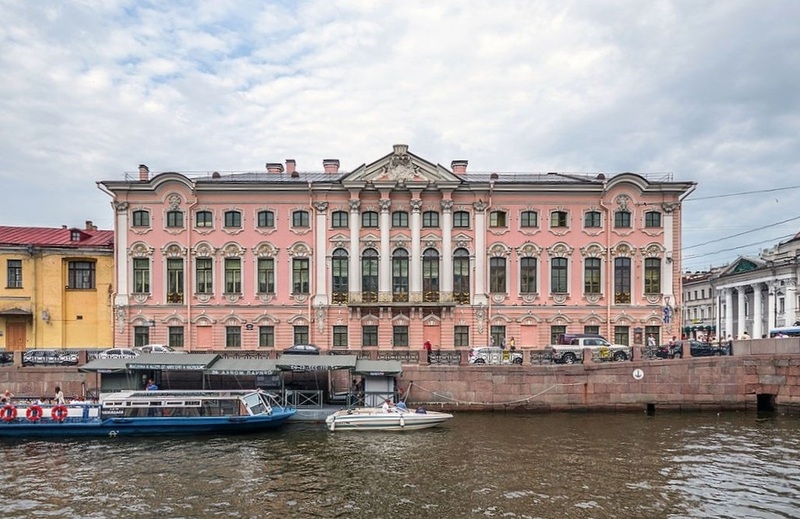 The building process began and by the autumn of 1754, a part of the building from the Moika side was ready. In October, a celebration took place on the occasion of a housewarming party, at which even Empress Elizabeth Petrovna was present. The entrance to this building was arranged from the yard. In the house only seven rooms were ready, so guests had been feed in a few shifts. Soon there was a masquerade on the occasion of the birth of Grand Duke Pavel Petrovich and the celebration of Elizabeth Petrovna's Birthday was held. The building was completed in 1756, after the death of Sergei Stroganov. Francesco Rastrelli built a three-storied palace in the form of the letter "G", its facades overlooking the Moika and Nevsky Avenue were decorated with the most beautiful architecture in Italian style. The architect wrote that there were 50 rooms in the house, "the large front staircase is richly decorated with stucco, iron gilt rails. "The design of the Great Hall was createded by skilful Italian masters, the gallery was decorated with mirrors and gilded sculpture, as well as plafonds made by Italian painters. This building was the first time in Russia, when a court architect created a building for a private customer. The Stroganov Palace is a striking example of Baroque architecture. The facade is decorated with many decorative elements and elegant platbands, columns and sculpture. Particularly interesting is the central part of the facade from the side of Nevsky Prospekt, decorated with sculptures of female figures - caryatids. The composition of the Stroganoff emblem is completed with a picture of two sables holding a shield with a bear's head in front paws. For your information: The Stroganovs are a kind of Russian merchants and industrialists who came from the Pomeranian and Novgorod peasants, Ermak's campaign to Siberia was equipped with their means. The Stroganovs owned factories in the Urals and were engaged in fur trade. Sable, like the bear's head are the symbols of Siberia, meaning that the ancestors of Stroganov contributed to the conquest of this region by Russians. In the piers between the windows of the building there are medallions with a male profile, giving the facades a unique appearance. It is believed that this is a relief image of Count Sergei Stroganov, but there is another opinion: perhaps it is a portrait of Rastrelli himself, who thus left his own autograph on the facade of the building he built. The Stroganoffs Palace was famous for having open lunches in its inner courtyard, where every decently dressed person could eat. Hence the word "befstroganov" meaning "meat in Stroganov" (bœuf in French means "beef"). It is said that someone for more than 20 years came here for lunch, and when he did not come one day, everyone started talking about his death, although no one could remember his name. In the following years the building has been repeatedly rebuilt by architects Fyodor Demertsov, Andrei Voronikhin and his pupil Peter Sadovnikov, Ivan Kolodin and Carlo Rossi worked on the interiors. The Stroganov Palace was famous for its art gallery, designed by Andrei Voronikhin. There the best collection of paintings in Russia was located, represented by paintings by SandroBotticelli, Agnano Bronzino and Van Dyck, Claude Lorrain and Rembrandt, Rubens and other famous artists. The regulars of the St. Petersburg salons did not doubt that the former serf Andrei Voronikhin was the illegitimate son of Stroganov, as evidenced by such facts: he was brought up in the palace, taking advantage of the protection of the count, receiving architectural orders and moving on. By now, the only surviving interior, executed by Rastrelli, is the interior of the Great Hall of the Palace.All other premises were rebuilt in a later period.To the pearls of the parade interiors you can also include the Mineralogical Cabinet and the stunning Arabesque living room. By 1917, all the Stroganovs had gone abroad, the building was nationalized, some of the collections were handed over to the museums of the country, and some of the exhibits were sold abroad.In 1988 the Stroganoff Palace became a branch of the Russian Museum. Part of the premises on the ground floor of the building is occupied by the Museum of Chocolate and the Wax Museum of St. Petersburg. In addition, there are rooms where temporary exhibitions of works from the collections of the Russian Museum and collections of other major art collections take place. On the upper floors are interiors that have a centuries-old history and partially preserved the furniture of the XVIII century, as well as unique works of painting and sculpture. You can get acquainted with the Mineralogical cabinet of a member of the Imperial Russian Academy, collector and philanthropist Alexander Sergeevich Stroganov, the son of Baron S.G.Stroganov. The interior of this room was designed by the architect Andrei Voronikhin. In the Great Hall you will examine the interior of the main hall created by Rastrelli, as well as the unique plafond "Triumph of the Hero", authored by the Italian painter and decorator Giuseppe Valeriani. The Stroganov Palace is the only building on Nevsky Avenue, preserved in an almost unchanged form.